Raspberry Ketone Force is one of the most effective weight loss supplements you'll ever see. The main ingredient, raspberry ketones, has a proven track record in the scientific world. Even better, it's perfectly natural, unlike other harsh stimulants or synthetic diet pills. Raspberry ketones are some of Mother Nature's best kept fat burning secrets. The natural botanical compounds in raspberry extract help give your body's natural fat-burning process work more efficiently. This process is called "lipolysis", and it tends to slow down and become less efficient in people who are overweight. Another unfortunate side effect of being overweight is a drop in adiponectin. Adiponectin is a special hormone that your body makes which helps keep you slim and healthy. Scientific studies show that the more adiponectin your body produces, the thinner you will be. Likewise, people who produce less adiponectin tend to be on the heavier side, especially around the waistline. Strangely enough, adiponectin is actually produced inside your fat cells. However, it does get secreted outside of the cell into your bloodstream when necessary. Its main purpose is to help your body oxidized fatty acids and regulate your glucose levels. Another fun fact about adiponectin is that it has an effect on heart health as well. Even people with metabolic problems, such as diabetes, will have fewer symptoms of coronary artery disease if they have relatively higher levels of adiponectin than diabetics who don't. In general, along with burning fat, adiponectin is great for protecting your heart health, improving your insulin sensitivity, and help improve your overall health and wellness. On the surface, lipolysis is a fairly simple process. When your blood sugar level drops, or when you don't have enough glucose in your bloodstream due to exercise (or other high-energy activities), your body secretes hormones which unlock your fat cells so your body can burn that energy to do work. Unfortunately, the more overweight you get, the more it creates a metabolic imbalance that causes your body to produce massive amounts of insulin. But the more insulin you have in your body, the more likely you are to transform sugar into new fat cells. When you get more adiponectin in your body, you upset this cycle and help increase your body's ability to turn on lipolysis. Long story short: raspberry ketones help you burn more fat and lose weight fast! Raspberry Ketones, Gelatin, Microcrystalline Cellulose, Magnesium Stearate, Silicon Dioxide, Titanium Dioxide. 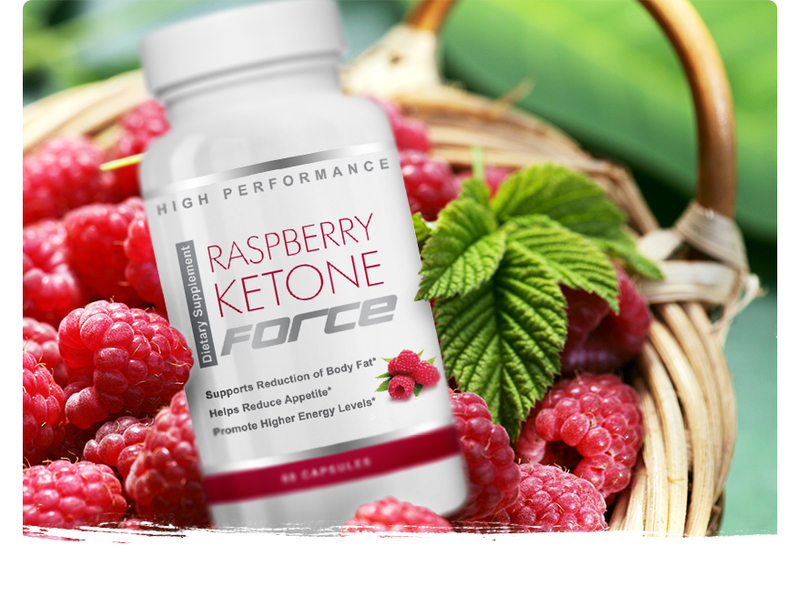 Experience the benefits of Raspberry Ketone Force for yourself. Try Raspberry Ketone Force today! Copyright © 2019 RaspberryKetoneForce.com. All rights reserved. may vary. To optimize results, combine Raspberry Ketone Force with a healthy diet and exercise.